San Francisco, California – Paper or plastic? The City by the Bay that regulated Happy Meal toys, banned plastic grocery bags, and practically outlawed smoking, has a new target in its super radical health-conscious, eco-friendly crosshairs: plastic water bottles. City officials are considering an ordinance that would require owners of new and renovated buildings with water fountains to install special bottle-filling taps. The law is designed to encourage thirsty people to refill containers instead of reaching for another bottle of Evian, Crystal Geyser, Arrowhead, Alhambra or Aquafina. Now, Supervisor David Chiu is also proposing immediately banning water bottles in parks and other public venues. If the proposed ordinance is passed by the San Francisco Board of Supervisors and approved by Mayor Ed Lee, the only water that would be allowed to be sold, distributed and consumed in buildings and public parks would be water in paper bags. Already, warehouse stores like Costco, Target and Walmart are considering a huge public relations campaign to oppose the proposed ordinance because it would significantly cut their sales of bottled water cases, a very popular item in their inventory. It’s time to start saving your brown paper bags. They may be the only way you would be able to drink your water in public if you live in, or visit, San Francisco. Sacramento, California (EXCLUSIVE to The Adobo Chronicles) – Here in the most radical state of the U.S., shark’s fin and foie gras (fattened duck or goose liver) are already banned, thanks to legislation passed and signed into law within the last two years. California’s law that prohibits the sale, possession, trade, or distribution of shark fins went into effect in July this year, ending the longtime Chinese custom of serving shark’s fin soup. On the other hand, a federal appeals court ruled last September that California can keep in place its ban on the sale of foie gras. The law prohibits state farmers from force-feeding birds with a tube, a procedure used in producing foie gras. The law also prohibits the sale of the delicacy. Now, in a new move that would inarguably seal California’s reputation as the world’s top melting pot of progressives, conservationists, environmentalists, human and animal rights activists, a bi-partisan group of state assemblymembers is proposing a new set of legislative bans. The proposed bill will prohibit the sale of lechon (Filipino roasted pig), roasted duck and boiled crab throughout the state. The legislators cited the inhumane procedures used in cooking or displaying these traditional delicacies. 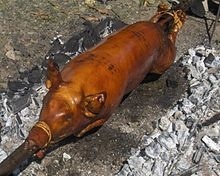 Suckling pigs are bound and skewered in one whole piece before being roasted for hours over a fire pit. 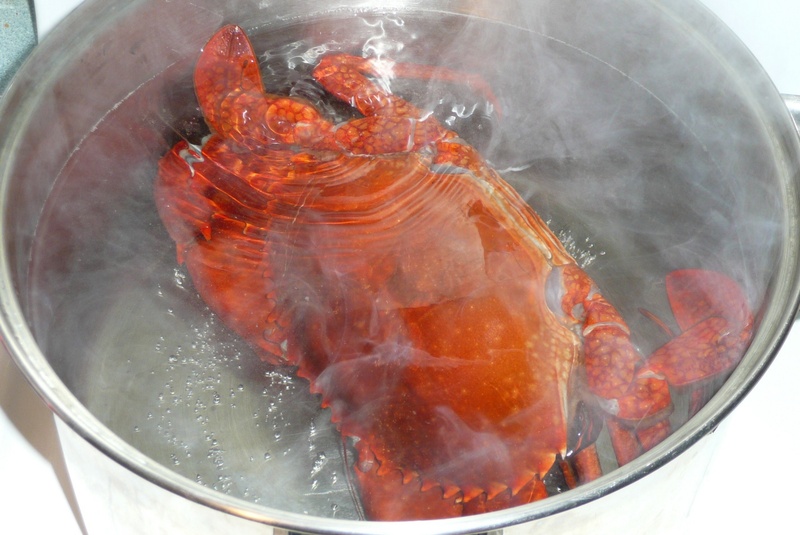 Live crabs are boiled in huge pots. 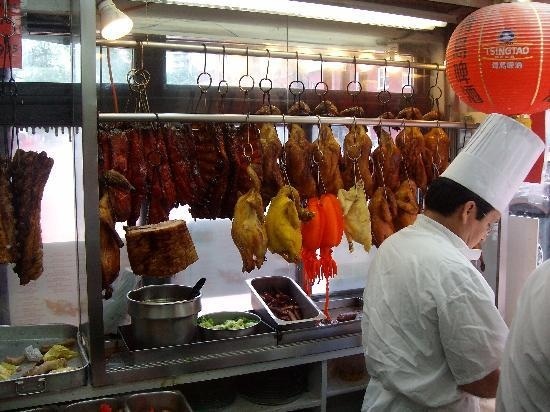 Roasted ducks, on the other hand, are displayed stark naked in windows of Chinatown restaurants and food shops, hanging in iron hooks. The Adobo Chronicles learned that this is just the beginning of a series of legislation that will look into other inhumane practices used in California’s multi-ethnic and diverse food and restaurant industry. California voters concerned about other cuisine practices are urged to contact their assembly representatives. A toll-free hotline has been established for this purpose: 1 -000- BAN FOOD.